1) Create/Add a new project of type "WPF Custom Control Library"
2) Add a new Item of type "Window (WPF)"
The EnableModelessKeyboardInterop() call is necessary to handle keyboard input in the WPF window if loaded from a non-WPF host like WinForms. I understand there are other ways to do this and you can read more about WPF/WinForms interop here. Now that Preview 4 is out, I revisited the prototype and got it working again. I use the term working loosely here. Yeah, it works, but it is really rough around the edges. That glue code is placed in a c# library called IronRubyMvcLibrary, which also contains support for .rhtml view pages. The objects you need to use from within the view page is accessible through Ruby global variables - $model, $response, $html and so on. 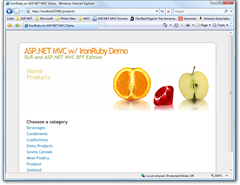 As John and Phil points out, this is a prototype and a test to try out a few things with IronRuby and MVC, and I think it's cool. Much will change over time, like how they use instance variables on the controller to pass data to the view. This is a step towards something which may become quite popular in the Ruby community, and perhaps to Rails people who has to, or wants to, write web apps on the .NET platform in the future. For those that hasn't been looking at IronRuby yet and want to have some fun with this - note that you don't have any intellisense or anything lika that in Visual Studio yet. Justin Etheredge wrote a detailed step-by-step blog post about how to download, build and get IronRuby up and running which is really good. There is also the new wiki on the official IronRuby web site (www.ironruby.com) which covers the same topic and also has a few code samples that might get you going a few steps further - look at the FAQ pages. Rob Conery did another excellent episode of his MVC Storefront series the other day where he ripped out his user membership code and replaced it with OpenId. Implementing the whole OpenId protocol yourself isn't necessary as there are some great libraries for you out there which makes it really, really simple to use and integrate with both WebFoms and A SP.NET MVC. Rob uses the DotNetOpenId library to authenticate the user but didn't show how to fetch user details like the user full name. Well, this is possible using Attribute Exchange which is a way of transferring information about the user between the OpenID provider and relying party. The DotNetOpenId library supports this too, and it just requires a small change to the DotNetOpenId code samples I've seen out there. Just keep on adding the attributes you're interested in, like email, website etc. 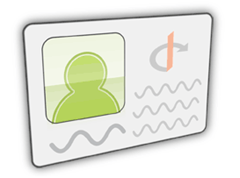 Remeber to inform your user about you wanting to fetch the extra information before doing the authentication. Note that DotNetOpenId library offers a few "well known" attributes as enums which all uses the "axschema.org" schema, but they do not work with the myOpenId provider. That's why I'm using the "schema.openid.net" schema instead. myOpenID supports only some attributes that can be exchange with OpenID Attribute Exchange, but you should care about Type URI, because myOpenID doesn't support Type URI described on "http://www.axschema.org/types/". You should specify Type URI with "http://schema.openid.net/" instead. It could be I'm using an older version of the DotNetOpenId library and it's been changed in newed releases. I have to check this out. Also, Andrew Arnott has written a longer post on how to use DotNetOpenId's Attribute Extensions extension which you should read if you want some more in-depth sample code (he's using ASP.NET WebForms).